So what happens on race day? I like to arrive at my events about an hour or so before the start time. You’ll find that most people arrive around this sort of time. For your first event, you may want to allow a little more time to get yourself sorted. The danger is that you’ll have too much time to worry about stuff and flap about. I’ll leave it to your knowledge of yourself as to which is better for you! When you arrive, you will need to take your race license to the “signing on” desk. You will need to sign the signing-on sheet (note that you are signing that you compete at your own risk etc, etc – there is legal stuff on there). You will hand your license to the organiser and they will give you a race number. Check where this should be pinned. Some like it on the left, some on the right – it all depends where the finish judges/cameras will be placed. Also check if there is to be a rider’s briefing. At circuit races the commissar (judge) will just say a few words once the riders are lined up to start. But for a race on the open roads there is usually a briefing in the changing rooms 10 minutes or so before the start. You should attend this as safety information (warnings of pot holes, dangerous junctions etc, etc) and any event specific instructions will be given at this briefing. Having signed on, you need to go get your bike together, get your numbers pinned on (pins are provided – but I always take my own so save messing about), get changed and get yourself ready. Make sure that you have your race food and drink sorted. I generally eat some carbs during that last hour before the race and make sure that I am not starting dehydrated. For us older gentlemen, that can be a bit of a balance between drinking enough and needing to pee every 3 minutes before the start. Again, you need to figure that one out yourself! Punctures are an occupational hazard for us cyclists. 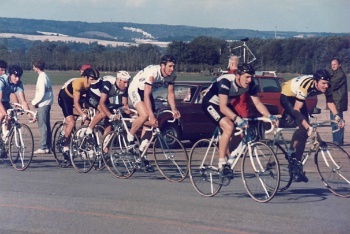 At circuit races you are often allowed to take a “lap out” in the event of a puncture – so I will take a spare pair of wheels that I leave at the start finish line so that I can make a quick change in the event of a puncture. Some (very, very rarely!) road races have a following car that will carry spares, but generally speaking in a road race on open roads if you puncture – that’s it your race is over. Even if you can get a fast wheel change, there’s no long convoy to helpful team cars following our races like you see for the pros on TV – it’s just you against the wind trying to close down a charging bunch. Pretty much no chance! However, I always carry a spare tyre, levers and a mini-pump when doing road races. I don’t fancy being stranded by a puncture 5 miles from the HQ and having to do the walk of shame in the pouring rain. But you see it (the walk of shame) every season. I assume that people want to save that few grams of weight or something. Again, it’s down to you. But don’t expect me to drive around and pick you up if you can’t be arsed to carry a spare! So your bike is ready, tyres pumped, drinks in cages, food in pockets, pump and spare (pockets or under saddle or wherever) – you’re ready for your warm up. You should always warm up. Short circuit races tend to start faster than longer road races. But even longer races can go from “the gun” so it pays to be ready. Again, warm up is a personal thing. I like to get 10 – 15 minutes in if I can. Some people like to do this on a turbo trainer but most just go for a ride (I am in the latter camp). Warm up done, make sure you get to the riders briefing if there is one. After the briefing there will be time for that one last pee and then it is time to go straight to the start line. For circuit races, just get yourself to the start line a little in advance of the designated start time. With that, there will likely be a shout of “away you go…” and that’s it, you’re off and in your first road race.